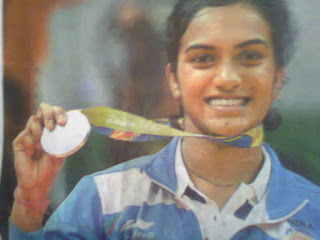 You are a great star, PV Sindhu! Thank you very much for making us proud of you. We are so much proud of you, Dear daughter of India. You have been the shining star at Rio Olympics. You played it so talentedly and confidently and fought it till the end and got that Silver for India- the first ever Indian woman to clinch a silver medal in Olympics history. The Badminton finals game at Rio 2016 has been a great sight to be watched. The strokes played by you were simply perfect and smart and well-calculated. It has been a great feast watching both of you, PV Sindhu and Spain's Carolina Marin, playing such superb strokes and with such equal skills. It doesn't matter (even though it matters for history and records purpose) whether you got the Gold or not. It is the talent and the sportsmanship you displayed that counts. You displayed a very wonderful talent and played the entire game with so much endurance, determination, sportsmanship and without losing your confidence until the last minute. That's a great point and quality which makes you shine even more. And, in the end, when you could not make the Gold you never did break out. You simply went to the winner, Carolina Marin, who was crying with joy laying on the ground and hugged her so warmly and congratulated her with your full heart. That is what is required here in sports. Sports and games always mean one would win and the other will lose. But taking it as it comes and accepting the fact is a great quality. You kept that dignity of the sportsmanship. Keep up your spirit and go ahead with challenges and never lose the confidence in yourself. Medals will keep coming on. Best of luck, Sindhu, India's Top Badminton Player!